One page, Autograph Note Signed, Lincoln issued on December 8th 1863 a proclamation giving soldiers of the Confederacy the opportunity to take an oath of loyalty to the constitution. This oath would discharge and pardon them, despite the fact the war was not over. Here Abraham Lincoln writes in his hand a brief note allowing confederate soldiers to take the oath of December 8th 1863, be discharged and return to their homes. 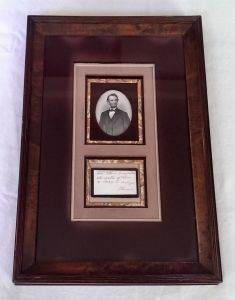 Lincoln’s handwritten note has been triple matted and elegantly framed with an engraving of Lincoln. Boldly written in excellent condition.